It’s Friday! And beyond that being awesome news in itself, there’s also a new Albert the Alien to greet you this fine day! Back in the classroom we see Albert’s alien school supplies are up to no good. In fact, they’ve gathered the remaining schools supplies in the classroom and lined them up for inspection. The laser pen is really kind of a drill sergeant, isn’t he? Too bad our school supplies aren’t really in boot camp – they’re not even alive! It’s funny he immediately assumes them to be lazy, but in truth they need us to operate. 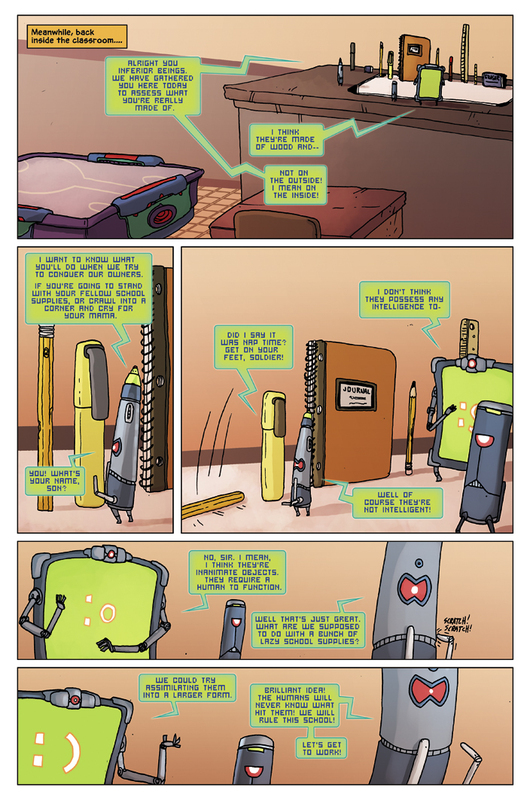 However, Albert comes from a different world where the school supplies can think and act for themselves. And as we’re finding out here, that’s not always for the best. I really enjoyed Gabe’s emoticon’s on the alien tablet, which were super cute. I’m only familiar with a few emoticons myself. What are some of your favorite emoticons? Do you like Albert the Alien? If so, then please share, tweet, and post this website to your friends and fans and let them give Albert and try. Also, please give us some love and vote for us on Top Web Comics at the link below!